Take a relaxing trip to Mexico to take in the sun while taking in some of the local culture. Click here to play! Not only is a fantastic time, but you could also return with a pocket full of pesos. You’ll need a tour guide to help you make your way through Mexico while winning plenty of cash, so be sure to keep your eyes peeled for the eye-catching senorita and senior. These two highest paying symbols and will earn up to 3,000 or 135 coins respectively. Find yourself a burro as well, as you’ll need this friendly animal to make your journey through all of the local towns. Spin two or more burros across the single payline to pick up a maximum payout of 60 coins. Be sure to take in some of the local music, drink, and food, as these symbols will payout handsomely as well. This includes guitars, tequila, limes, maracas, and chilies. 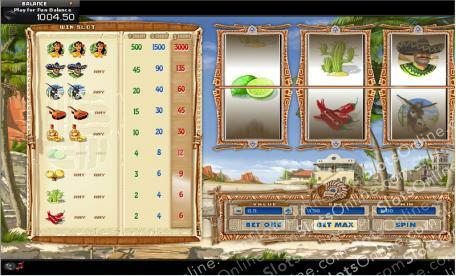 The Mexican slots allow players to wager coins. Each one is worth 50¢ and you can put in a maximum of three. Be sure to wager all three if you want to activate the highest pay table. Are you ready for a trip through Mexico? Spin these reels for plenty of fun and a chance to bring in some massive payouts.